This week celebrates Global Accessibility Awareness Day on Thursday 21st May, and provides a valuable opportunity to consider where we are in terms of the utilisation of technology and the inclusive modes by which all varieties of users access this technology. Particularly within the disability sphere, we are afforded the chance to highlight the creative gains made in this space that are allowing individuals around the world to access life on their own terms with the latest technologies at hand. One of the most fascinating developments this year being showcased as part of Global Accessibility Awareness Day is the availability of the new Apple Watch. There have already been myriad news stories detailing the accessibility uses of Apple Watch since it was launched: this Sydney Morning Herald article on how 20-year-old British woman Molly Watt, who has Usher Syndrome and is deaf and blind, uses Apple Watch to communicate and navigate in a host of new ways (her blog is an awesome read as well); this creative use of Apple Watch detailed on Business Insider regarding the utilisation of sign language; further developments highlighted in The Australian that Apple Watch is building on regarding its 'taptic engine' and the further physical feedback that will be explored here; and this workshop that David Woodbridge (Senior Adaptive Technology Consultant at Vision Australia), Alex Jones (co-founder of Ai Media and star of the AUSLAN component of popular iPad app Hairy MacLary) and David Niemeijer (founder and CEO of AssistiveWare) ran this week on the varied accessibility uses that Apple Watch provides to users. See too that the American Foundation for the Blind has just announced that Apple will be receiving the 2015 Helen Keller Achievement Award for their breakthroughs in accessible technology. My own interest in the accessibility of Apple Watch has been focused on its utilisation for individuals on the autism spectrum. Before its release I considered that one of the key areas of need for individuals on the spectrum, the needs associated with executive functioning (those skills associated with planning, organising, remembering, paying attention, staying on task, and problem solving), could find great benefit in the way that Apple Watch operates. In this blog post, I want to highlight some of the apps I have been exploring that I can see benefits towards meeting executive functioning needs in high school, higher education and work settings for individuals on the autism spectrum. The Clock Face is the first visual you encounter when you lift Apple Watch up to check the time. You are provided the option of customising your clock face to incorporate whatever functional details you'd like to readily view when you check the time. For example, when the sun will rise and set, the current date, and any pending calendar appointments. You are able to adjust and edit the way these details appear, to reduce visual complication for example. Regarding executive functioning skills, one of the most useful details here is the display of pending calendar appointments, to help pace daily expectations and to anticipate upcoming requirements. When you touch the watch face on your upcoming appointments, it takes you straight to your Calendar. Your calendar is a direct sync of all the information on your iPhone. You can quickly glance at upcoming events and seek further details regarding requirements for those events, including when reminders are set, and you can move in and out of the monthly view to access future schedules. When you set reminders to help you prepare for a particular event, Apple Watch provides a physical buzz with its taptic engine to prompt you. The app Things is a fantastic tool for keeping track of upcoming tasks you need to complete. You can add notes quickly with Siri voice dictation, and can add due dates to help track when tasks are due. Quickly taking a glance at your upcoming tasks during the day, and ticking the ones you complete, provides an effective and simple way of organising and keeping track of pending requirements. Evernote is already one of the key apps that I recommend as part of my Educational Outreach work for students to help keep notes across the school day, take photos of tasks and whiteboard notes, scan in work samples, set reminders for assignments, and maintain a daily diary to help facilitate continuity of emotional engagement across home and school settings. On Apple Watch, Evernote is able to provide you with a quick way of viewing notes you've made on your iPhone or iPad, and also allows you to add dictated notes that are automatically synced across your devices. Learning the ability to time oneself in order to estimate how long it should take to complete a particular task is a valuable skill towards improved executive functioning. Analysing the components of a task and making projections as to what you can achieve in a certain amount of time allows for better planning and staying focused on completing a task. The Stop Watch allows the user to modify the way it is displayed on screen, between analog, digital, graph based and hybrid visual representations, and a Timer allows for set durations to reduce until completion. Physical activity is a valuable consideration within executive functioning needs for the reason that we often need reminding to stop engaging in a special interest or passion project and take pause for a moment, to stand up and walk around and have a break. The visuals that are part of the Activity app on Apple Watch allow you to keep track of when you should be taking a break, and how you're doing towards daily exercise and movement goals. You can earn visual rewards that appear on the screen when you achieve particular Activity milestones, which provide good extrinsic positive reinforcement feedback to continue consistently achieving goals. When we have conducted research projects in the past on apps such as Strip Designer with our students on the autism spectrum, with a focus on using the app to create social stories and recounts of lessons, we have been surprised just how often students have decided to use these apps to create comic strips, drawings and photo sequences of favourite special interests that they look at when they are experiencing periods of frustration or concern. Looking at preferred imagery is a valuable well being strategy to help emotional regulation. In this way, having albums of favourite photos to quickly scroll through and take in is a terrific visual regulation strategy. In similar consideration of emotional regulation, Realifex allows you to record your personal experiences with simple prompts, that are then synced to your iPhone and composed in a format that allows you to see contextual data and visuals that help you reflect on emotional patterns in your life. You can see from the screenshots above the variety of prompts that help you to consider events you are experiencing, to consider the impact of the event, how it makes you feel, with the option of dictating a short note to help further reflect on the moment. A dashboard on the iPhone app then displays a series of detailed visuals in an emotional diary manner to further aide reflection. Eidetic is a study tool that, like Evernote, is a regular recommendation of mine to help students remember not only academic requirements such as numeracy facts or historical dates, but also social information such as the names of staff in the school, or the social steps involved in preparing for a job interview, for example. 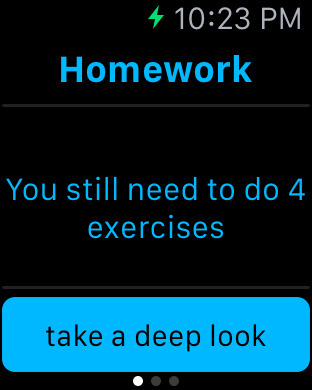 On Apple Watch, the facts and other requirements that you need to remember are readily available at regular intervals across the day to test you and help you progress towards mastery. The next three apps are all school timetable apps that approach subject and scheduling prompts in different ways. Timetable Pro+ allows you to schedule your subjects across weeks, with the option of having multiple calendars that you can refer to for different contexts (one for school, one for music lessons, one for work placement, for example). 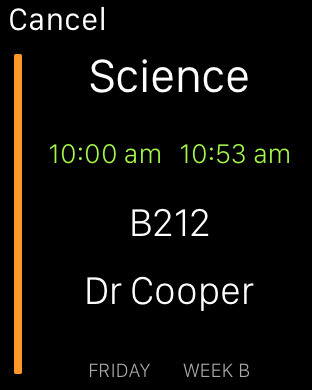 Colour coded subjects with the scope for detailed notes to be included on the screen makes for a very handy Apple Watch timetable app. Subjects is an app that encourages quick glances at your Apple Watch to navigate upcoming school subjects. Timetables can be planned across two week repeating schedules, and handy visuals can be utilised to quickly depict lesson subjects. Colour coding subjects is available as an option as well, which is often something we encourage high school students on the autism spectrum to do in order to clearly differentiate lessons on often visually busy time sheets. On Apple Watch this visual distraction is reduced to a minimum with clear subject displays. With Schoolonator you are provided the opportunity to add Homework notes and checklists to your school timetable, to combine some of the elements mentioned above in apps such as Things and Evernote. 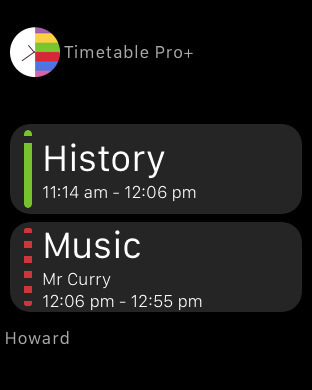 As with the above apps it favours a clear visual display of subject schedules, and syncs your timetable and associated notes across your iPhone and iPad. A valuable addition to an executive functioning suite of school apps. I hope the above summary of some of the initial Apple Watch apps that meet executive functioning needs are helpful for you to consider in support of students and young people on the autism spectrum. 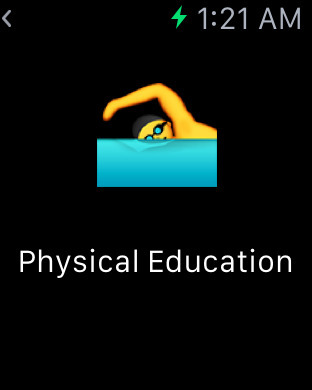 As I continue to explore Apple Watch in autism education I will be covering further related subjects. 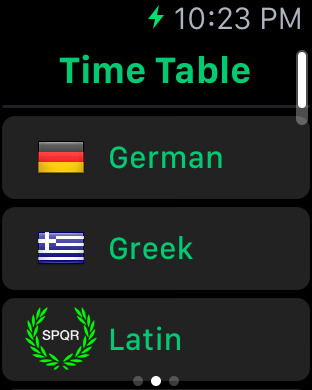 I am constantly surprised at some of the daily applications of Apple Watch that help me organise myself - only this past weekend I was trying to remember a breakfast order for my family at a local café when my wife quickly e-mailed me our preferences as I waited in line, quickly opening it on my Apple Watch and reading it out to the waitstaff. I'd love to hear how you're finding similar functional benefits in your own life.